So having completed The Hydra Offensive last week, I’ve started my first round of edits. I usually go through 2 rounds of digital editing, get the novel printed and do 2 paper runs, and then finish up with a final digital run before I send it off to Beta Readers. I’m going to treat my paper runs a little differently than I’ve treated other paper prints. I’m going to get it printed out by chapter rather than as a whole. I’ll read through once in full chronological order, and then for my second pass I’m going to read each POV group from start to end to hone in on any inconsistencies. Speaking of which (! nice segue huh?) I’m looking for people who would like to Beta Read The Hydra Offensive. I’m definitely looking for people who read The Cerberus Rebellion, but I’m also looking for people who might not have read Cerberus yet. I’m trying to make Hydra as new-reader friendly as possible and I would greatly appreciate feedback on how I did. Having completed The Hydra Offensive last night, I’m going to give another try at the blurb. I trimmed it down, and tried to make it fit a little better into my strategy of making Hydra “new reader friendly”. It’s as true for a fantasy world as it is for ours. But how does one mark the passage of time? Seconds, minutes, hours, days, months and years are all terms that I would wager every adult in the world would be familiar with. But while they measure a quantifiable event (the passage of time) these words are all constructs of humanity. What month is it? What year? These are the two most significant calendar events that are arbitrary assignments that someone long ago created. But if we created these in the real world, then it stands to reason that the people of your fantasy world’s are going to do the same. Calendars, as subjective measures of time, can be based on a variety of standards and use a multitude of events as their baseline. Today, I’m going to talk about some of the different ways in which time can be measured, common events to use as a base, and give some examples from the Griffins & Gunpowder Universe. The cycle of your calender is what you will use to decide how long each phase of your year will be. These should be easily defined and easy to keep track of. Lunar Cycles will use the moon’s natural cycle to measure time. The length of these cycles will be dependent on the specifics of your world, but for our world each cycle would be 28 days long. For a twist on your world’s lunar cycle, the addition of more moons can give you more options. A calendar that uses Equal Division will be more straight forward. The year will be divided into a group of months that all have the same amount of days. The calendar we use today is very close to this, with the distinct exception of February. A Seasonal Calendar will use the orbit of your planet and the natural changes of the seasons to measure time. This type of calendar can be more difficult in areas of your worlds where seasons are either poorly defined. Seasonal calendars don’t necessarily mean Spring, Summer, Autumn, Winter; instead, they can also use Dry and Rainy Seasons in tropical regions. Arbitrary calendars are usually created by a powerful person or group and have no basis on any natural event. A particular egotistical King might be a good candidate to create one of these. As your planet rotates around its sun, natural seasonal events will occur. The spring and autumn equinox, the summer and winter solstice. In addition to being a part of your calendar’s cycle, these can be the events that mark the passage of years. Arbitrary calendars choose a day and make it the beginning of the calendar. The common calendar used in our world bases itself on an arbitrary day (January 1st). Cultural calendars are a form of Arbitrary calendars, though they use culturally significant events as the basis for their cycle. These events can be religious or tribal (such as a feast schedule or holy days). The Hebrew calendar is a Cultural calendar. Basing your calendar on the rise or fall of an empire can give your calendar social importance in addition to just telling time. It also serves as a way to tell history and measure progress from the humble beginnings of the empire (or regress since its fall). The first day of a colony’s existence can be used to start your calendar. A calendar that bases itself on the colonization of a nation also serves as a measure of history, marking each year of success for the nation. A less common type of calendar would base itself on some form of treaty signing. Perhaps marking the passage of time since a truce was signed, or since an alliance was formed. In a fantasy, and even in a Gunpowder Fantasy, there are going to be multiple types of calendars. This will be especially true in a world that doesn’t have a unifying organization as powerful as the Catholic church was in our world. On the world of Zaria, there are a dozen major calendars observed throughout the world. The Ansgari Calendar is an equal division calendar, based on the colonization of Ansgar. The calendar is divided into ten months, divided into four weeks with ten days each. The Nordahrian Calendar is lunar calendar, measured from the signing of the First Accords, a set of treaties that brought peace to the nations around Nordahr. One aspect of traditional fantasy that I’ve incorporated into the Griffins & Gunpowder universe is the concept of a Knighthood as a part of the Military Apparatus. For the nation of Ansgar, the Knighthood is part of the Chain Of Command but is not a requirement to become an officer. While a knighthood comes with a Commission, a Commission does not come with a knighthood. There are three ranks of the Ansgari Knighthood: Knight-Lieutenant, Knight-Captain, and Knight-Commander. Each level of the Knighthood is considered the equivalent to a half rank. So, a Knight-Lieutenant B half a rank above a commissioned Lieutenant but also half of a rank below a commissioned Captain. The same is true of Knight-Captains between Captains and Majors, and Knight-Commanders above Majors but below Colonels. Another unique aspect of the Ansgari Knighthood is that only the King can grant a Knighthood. Because of the distance involved, and the King’s increasing apathy toward them, the Western Nobles of Ansgar have a Muck lower occurrence Of knights within their ranks. Depending on what parts of Traditional Fantasy you include in your world, consider different ways to integrate the title of knight. Here’s the first bit of The Hydra Offensive! I’m just about finished with the first draft, so if I work hard, I can have it out by January! Please be advised, this is literally the first draft so it hasn’t been edited. The Red Dragon’s Gold is Free! So in an attempt to bring additional readers to the Griffins & Gunpowder universe, I’ve decided to set my short story, The Red Dragon’s Gold, as Free! on Smashwords and Kobo (and hopefully on Barnes & Nobles and Amazon soon). So please, pass word along to anyone looking for a short story (approximately 6,900 words) and feel free to download and read. So far, I’ve covered the Industrial and Commercial effects that an Industrial Revolution would have on a Fantasy World. 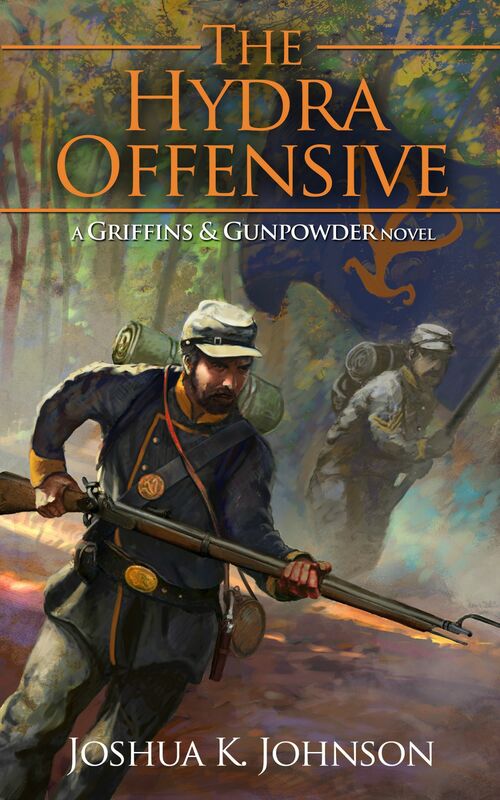 I’ve also discussed how Gunpowder Fantasy affects Communication, the Arms Race, and gone over the basics of weapons technology in Gunpowder Fantasy. But weapons weren’t the only aspect of the military the gunpowder changed. Tactics saw a major change during the Industrial Revolution, and especially as a part of the American Civil War. Often referred to as “Napoleonic” tactics, armies before the American Civil War used basic flintlock and percussion muskets, which were notoriously short-ranged and inaccurate. Soldiers would line up in tight ranks of thousands of soldiers and march at the enemy. Because of the short range and inaccuracy of their weapons, the soldiers could get within a couple of hundred yards before they were in any sort of danger. The soldiers would fix bayonets and charge across the final few yards to fight their enemies in hand-to-hand combat. During the early civil war, these tactics were still largely used, despite the fact that much improved weapons had been developed. But as technology advanced, and generals began to see that the old tactics were inefficient, strategies and tactics began to change. Skirmishers became a major part of armies, moving ahead of the main army in small groups stretched across a thin line. Skirmishers screened larger battle elements, harassed enemy skirmishers, and scouted the enemy force for weaknesses. A major change was the “Strategy of Maneuver” which taught that outmanuevering an enemy was the better way to victory, rather than brute force. Armies began to seek out advantages in the form of natural defenses and position, rather than bringing as many men to the field as possible. When you’re creating your world, I feel it’s extremely important to consider where in the development of military tactics and strategy you will be placing your conflict. A part of this is the exact technology level you choose (early flintlocks or advanced rifles?) but it’s also important to consider how recently a major war has been waged. In the example of Napoleon and the American Civil War. There were fifty years between the two major events, and weapons technology had a major leap in that time. If you set your world in a time with new technologies that haven’t seen a major war, your generals and armies are going to be fighting under the paradigm and theory of the last major war, rather than under the realities of the current technology. 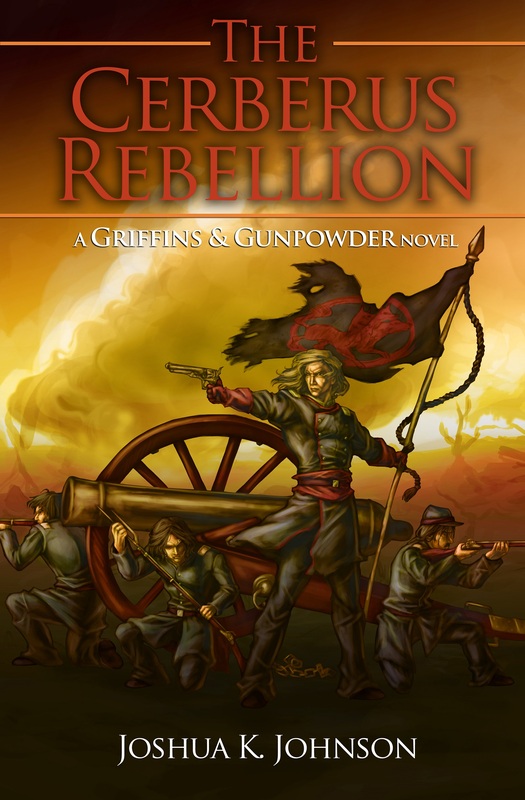 The world of the The Cerberus Rebellion, for example, is set in a world very similar to the American Civil War. The last major conflict is more than 100 years old and was fought with an entirely different set of weapons. The generals, therefore, are still using the mass-and-fire tactics of that war. But as the war evolves, will the tactics as well? But weapons and tactics aren’t the only thing that will change when you put your world through its Industrial Revolution. It is said that there are two things that drive a nation to war: fuel and food. And that an army moves on its stomach. Fuel is rather obvious: if your nation needs a fuel (say, Coal?) but it doesn’t have the necessary amount to sustain itself, it’s going to go elsewhere to find it. Food, on the other hand, can have various aspects to it. I discussed in a previous post how the Industrial Revolution affected Agriculture and the production of food. In this post, I’ll discuss how changes brought about by the industrial revolution and these changes in agriculture brought about change on the military side of the board. The biggest issue with marching an army across a nation has always been feeding the soldiers. People eat a lot, and soldiers who have to keep up their physical and mental toughness ate more. According to some reports, the average company from the North needed 125 pounds of pork or beef, 75 pounds of hard bread while in camp (more when on campaign), more than 6 pounds of compressed vegetables, 8 quarts of beans, 10 pounds of rice, 10 pounds of coffee beans, 10 pounds of sugar, and a gallon of vinegar¹. Well over 250 pounds of food for 100 men per day. All of that in addition to the water that those soldiers needed. Before the industrial revolution, this food would be hauled by wagons pulled by oxen or mules. But those animals required their own food supplies, cutting into the payload that could be devoted to the soldiers. With the advent and expansion of the railroad system, moving food became far easier. Campaigns could reach further and armies march harder if they didn’t need to carry their supplies on their backs. But this also led to a dependence on the rail system. Railroad stations became major hubs of activity and the rail lines that criss-crossed the nation became targets for sabotage. That’s something to keep in mind when you’re writing your world. Remember the importance of the rail system and logistics to your world’s army. Rail stations would need to be protected and would be likely targets for capture. Rail bridges would be strategically invaluable and a retreating army would likely consider burning any bridges they could in order to slow or halt the advance of their enemies. Before the Industrial Revolution, farming and food production was a major source of employment, but also a factor that limited expansion. Because a large portion of the population had to be dedicated to growing food and transporting it to where it needed to be, those same workers couldn’t be employed in factories and textile mills. But with the advent of coal and steam-power, and the Industrial Revolution, came the advancement of agricultural technology. The ability to dedicate fewer and fewer workers to growing or transporting food, and better yield for the seeds that were planted, allowed for cities to grow and factories to expand. Traditional fantasy settings will usually be placed before this change, and their towns, villages, and cities will reflect that status. There will be a great number of farmers and only a handful of craftsmen dedicated to the production of most goods. In a Gunpowder Fantasy, especially those set in the middle and later eras, your characters are going to find fewer and fewer farmers, and more and more unskilled factory laborers. How you approach this can be an important plot point, or a minor note in your worldbuilding. The improvement of food planting and transportation meant that people in the cities didn’t need to go out and farm their own food, but they still needed to pay for it. Workers that are paid a poor wage for long periods will become hungry and begin demanding better wages and living conditions. One way to approach this is to introduce unionization to your workforce, which can be a major political aspect if you want it to be. Where in traditional fantasies, Guilds of skilled artisans can hold great power, Unions that represent the common-man can be a part of your Gunpowder Fantasy. Industrialization and improved transportation methods also means better quality food reaching the populations of your city, which in turn has other effects. Longer life-spans means workers are going to be able to stay on the job longer, learning their trade better but at the same time requiring housing for longer and likely demanding higher wages for their experience. Families will grow larger as they are able to support more children than they could before. Agricultural advances will also have an impact on your militaries, which is a topic I’ll be discussing in a later post. The important thing to remember, as always, is to take the changes of the Industrial Revolution into account when you’re building your world. And Agriculture especially. As I mentioned in my post on The Industrial Fantasy Age, coal as a fuel and steam power had a profound effect on our world, and can have the same impact on a Gunpowder Fantasy world. Especially in the area of commerce. Before the industrial revolution, animal-pulled carts and sail and row-driven ships were the only method of moving goods from one place to the next. This limited the range that trade could be conducted, especially when perishable goods were involved. But as steam-power developed, and railroads expanded, commerce felt the impacts. Roads have always been an aspect of trade networks. Roads allow carts to travel through areas that would be difficult otherwise. As the Industrial Revolution developed, especially in England, these roads became an important part of the network. But maintenance had been the responsibility of individual cities and counties. This led to inconsistent maintenance and sometimes poor road conditions. Early in the Industrial Revolution, turnpike (or toll-way) trusts began to be established, taking responsibility for long stretches of road. Travelers paid a toll to use the road and those tolls were then used to maintain the road. A more universal level of maintenance meant a more consistent rate of travel and allowed carts to move faster between cities and transport hubs. Merchants could move their goods more efficiently from the smaller towns to the larger cities and beyond. Railroads were likely the most major transport improvement of the Industrial Revolution. What had once taken days and weeks to travel by horse or on foot, was reduced to hours and days. Railroads and steam engines also increased the amount of goods that could be carried from one industrial center to another. For merchants, not only did this increase the speed with which they could move their goods, but it also gave them access to additional markets for their goods. Sea travel before the Industrial revolution relied either on the wind and the weather or on oarsmen. Speeds were limited and ships found themselves immobilized by a lack of wind. With the invention of the paddle-wheel (and later the steam-powered screw engine) ships gained consistency, speed and an independence from weather. Commercial trading on rivers became easier and allowed merchants to move their goods cheaper (because they don’t need to pay or feed oarsmen). Commerce drives your nations. Not only do merchants move food and supplies from one center to another, but commerce drives the tax revenues that your nations use to fund their exploits and endeavors. Keeping in mind how commerce will be different in Gunpowder Fantasy will allow you more flexibility in how your nations operate. In fantasies, merchants are usually important members of society, but don’t have the reach that lords and nobles have. With access to railroads and their improved distribution, merchants become major players as part of your world. You begin to see “railroad barons” develop as they use their power to affect the world around them. For the many years that I’ve been writing, weaving some amount of political intrigue or drama into my stories has been a recurring theme. Whether it’s an MC who suddenly finds herself at the head of an emerging third power in a previously two-party system, or the quiet intrigue of nobles as they plot to free themselves from their King. Traditional Fantasy politics usually follows along the lines of the latter. Knights, Nobles, Ladies, Kings, and Queens vying for power, plotting and scheming against each other. For a good example of a strong political storyline in Fantasy, look no further than George RR Martin’s Song of Ice and Fire series. But that’s traditional fantasy. Travel in Westeros is slow and arduous; even messenger ravens take days to move notes from place to place. That allows for a much slower, long game form of Politics. But when you start introducing aspects of Gunpowder Fantasy, especially improved communication, the political game needs to evolve, and it needs to do it quickly.